28th of October. Glasgow. The Garage packed with glam rockers, old hard rock fans and others willing to see three bands: Dead City Ruins, Ugly Kid Joe and Skid Row. I probably won't be wrong saying, that most of them came to see Ugly Kid Joe either Skid Row. Or both. Anyway, the evening starts with Australian band Dead City Ruins, they don't play long – just half an hour. It seems as very good opening act to the next following bands: good old hard rock, lot of energy, stripping vocalist and not too long show. After some changes on the stage and sound check, Ugly Kid Joe on the stage. Audience welcomes band very warm, energetic show begins with the first accords. Their show is very enjoyable with good new and old music, hits that everyone knows like “Cats in the cradle” or “Everything about you” for the end. As the very last song the band plays Motorhead cover “Ace of spades”. Band members are very energetic and it looks like they are enjoying the process of the show themselves. The audience learns fast Whitfield Crane's movements and tricks, so the atmosphere in the club becomes very warm and cozy, at the same time – a little bit crazy. After 9 pm the last band comes up to the stage – Skid Row. That's pure energy! They start their setlist with a quite new song - “Let's Go”, following it by good old one - “Big Guns” and crowd is already going crazy. Overall, they have 15 songs on the list – few new but mostly old hits, some ballads as well (“I remember you”, “Darkened room”). Crowd sings together during almost all songs. Skid Row plays all the songs non stop, without the encore. 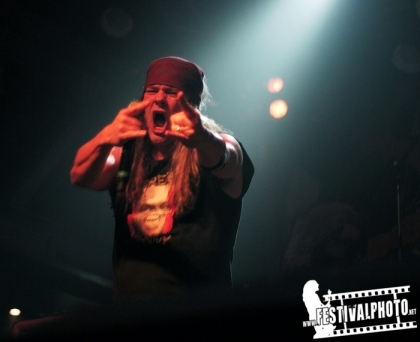 The only stop for the vocalist Johnny Solinger – the “Psycho therapy” - punkish song, known as bassist Rachel Bolan's song. Evening ends quite soon – before 11 pm, so everyone can check the merchandise and get back home with the public transport. The Monday is over. Great new week's start.